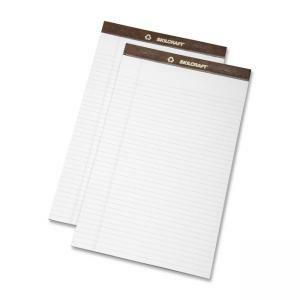 Writing paper pads contain 50 sheets of 16 lb. paper that is perforated for easy removal. Each sheet is ruled and has a margin. Top binding features a leatherette strip printed with "SKILCRAFT" and the recycle logo imprinted in gold. The backer board is made of extra heavyweight material (0.050 cal). Pads contain 50 percent recycled material with 30 percent post-consumer material and meet Executive Orders 13514 and 13423.